INDIAN SUBBODY BUTOH TOUR 2017 from jordi on Vimeo. PLEASE WEAR COMFORTABLE CLOTHES THAT YOU CAN MOVE FREELY IN. with Pil ARa Echavarria at Prana Lounge Colombo. An invitation to expand your dance and dive deeper into the wisdom of your body, to create and express your wild and true dance with Pilar Echavarria. 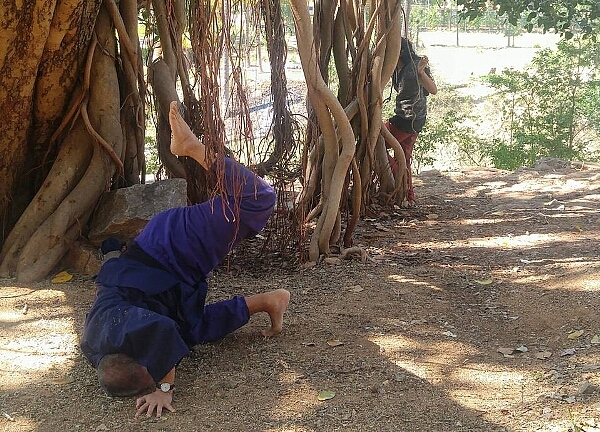 The essence of this workshop lies in listening to the authenticity of our body, in movement or in stillness, and allowing the inner dance to unfold. 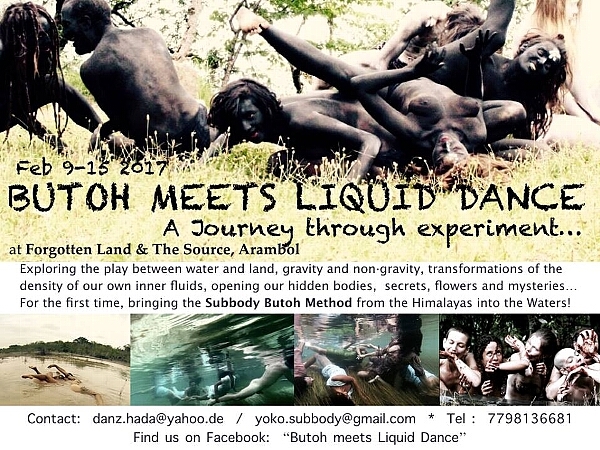 We would do this through practices, frames and scores of exploration from different methods of Subbody Butoh, Contact Improvisation, Somatic Movement Arts. Open for everybody that loves to Dance and have the curiosity to explore deeper into your body! 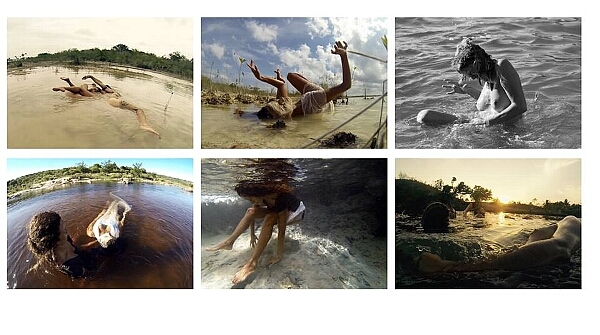 Pilar ECHAVARRIAhas been co*creating movement classes, workshops, and festivals to guide and explore Contact Improvisation, Butoh and movement in the water since 2010 worldwide. 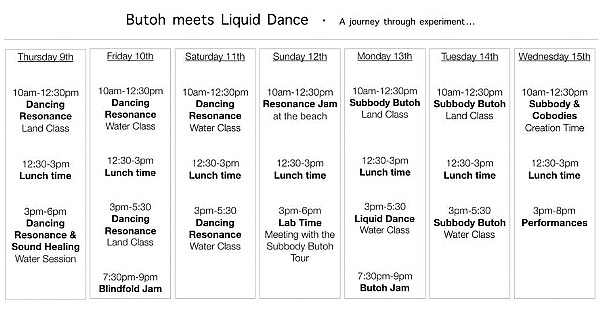 She is Organizer and creator of "Liquid Dance Laboratory" in Ibiza-Spain and "Liquid Flow Festival" in Mexico. Pilar has has been dancing and researching the body since 2006 through different arts and techniques of improvisation, movement and healing: Contact Improvisation, Butoh, Authentic Movement, Continuum Movement, Tao Shiatsu, Body Mind Centering, Axis syllabus, Somatic Arts, WaterDance, Watsu, HealingDance, Jansu and Aguahara; while learning and teaching, performing and creating, living and traveling around the world. Faust, Karl Frost and the CI Commuity in Argentina. In Butoh by Minako Seki, Atsushi Takenushi, Katsura Kan, Diego Pinon and the ‘Himalaya Butoh School’ in India where she studied for two years. 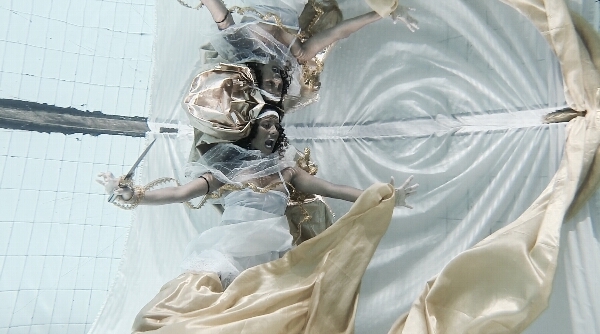 And in the Water Movement by Shantam and her own self research. "What people believe is truly unbelievable. It's a dogma-eat-dogma world out there." 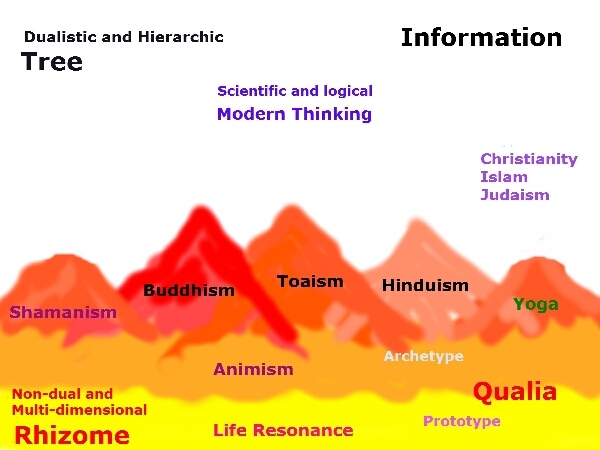 "Mount Meru of Hindu traditions has clearly mythical aspects, being described as 84,000 Yojan high (about 1,082,000 km (672,000 mi), which would be 85 times the Earth's diameter), and notes that the Sun along with all the planets in the Solar System revolve around Mt. Meru as one unit." Which makes it the black hole in the center of the milky way. The sri yantra is a 2d mapping of this object. 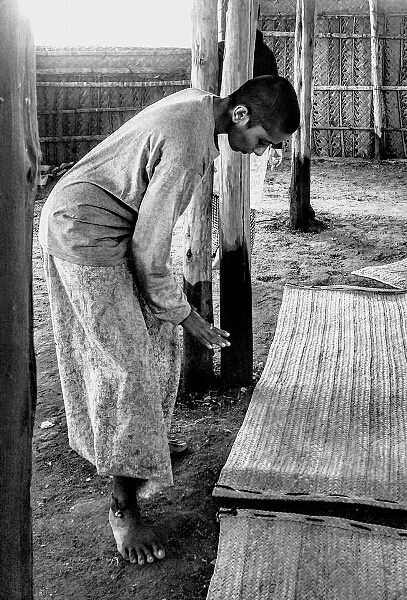 "Tantra has been labelled as "yoga of ecstasy" driven by senseless ritualistic libertinism. This is far from the diverse and complex understanding of what Tantra means to those Buddhists, Hindu and Jains who practice it. 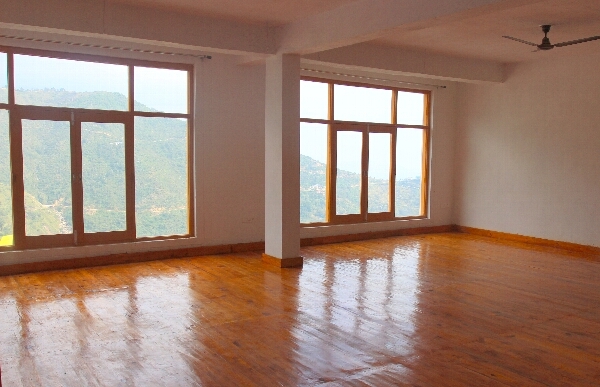 To its practitioners, Tantra is defined as a combination of texts, techniques, rituals, monastic practices, meditation, yoga, ideologies that are freely selected based on personal preference, or master-disciple developed, or guru-revealed." 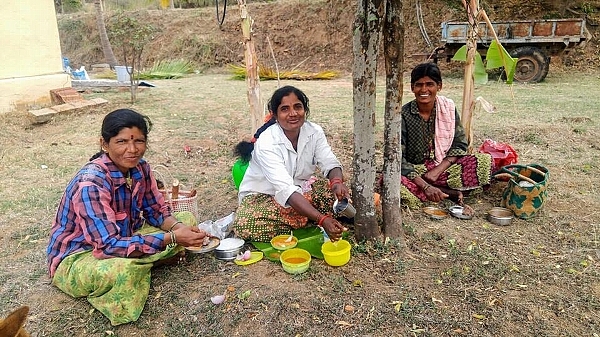 "Tantrism usually refers to a "systematic quest for salvation or spiritual excellence" by realizing and fostering the divine within one's own body, one that is simultaneous union of the masculine-feminine and spirit-matter, and has the ultimate goal of realizing the "primal blissful state of non-duality". 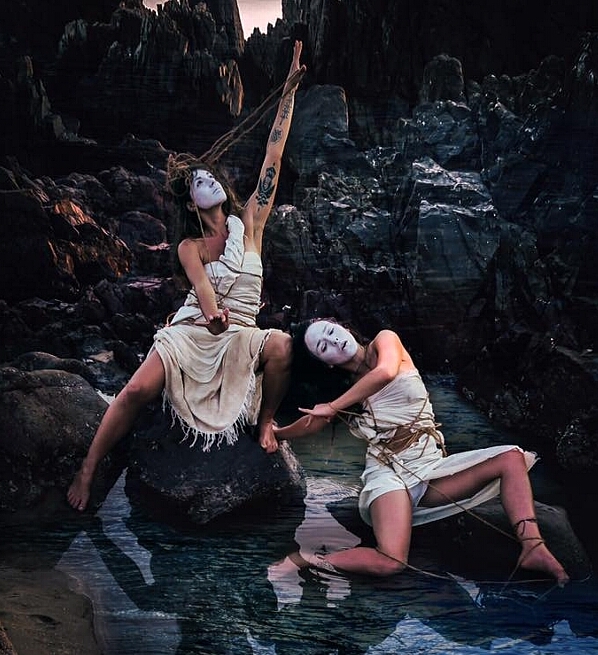 Come to explore the play between water and land, gravity and non·gravity, transformations of the density of our own inner fluids, opening our hidden bodies, secrets, flowers and mysteries… For the first time, bringing the Subbody Butoh Method from the Himalayas into the Waters! 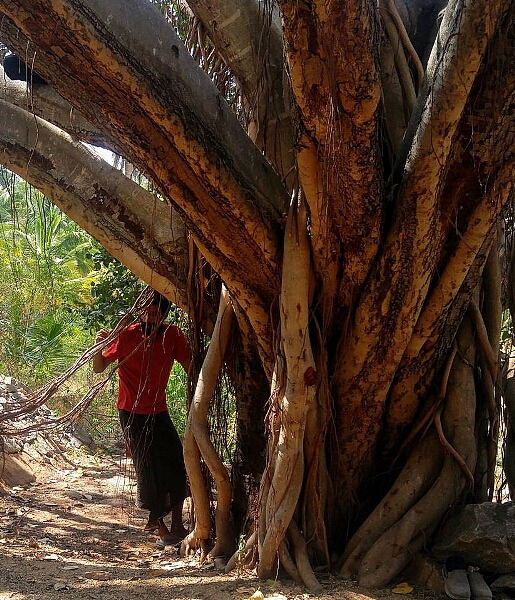 I'm in Goa now, and connected with the Subbody. 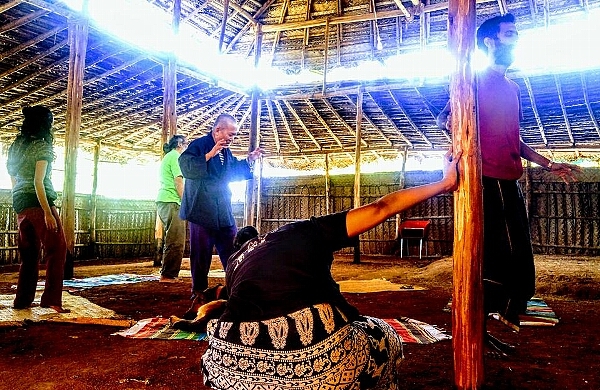 Since I arrived here I could perform 3 times with musicians and also I'm giving workshops for women on Sundays " The dance of the wild feminine". I can feel that my mission is to work with woman, holding space for the dark feminine. Exactly what personally I find in school. Last Sunday was successful workshop with tears and deep qualias and I could feel how Subbody method is been integrated in my creations and the way of listening and working with that. It's really excited! For that I just want to give my big thank you for you. Since I started with this research I feel completely inspired. The birth of Subbody mode is a mark in my body. And each day I can listen more to that state of Life resonating through. I feel that I want more, to go more deep, to learn more, to research more. 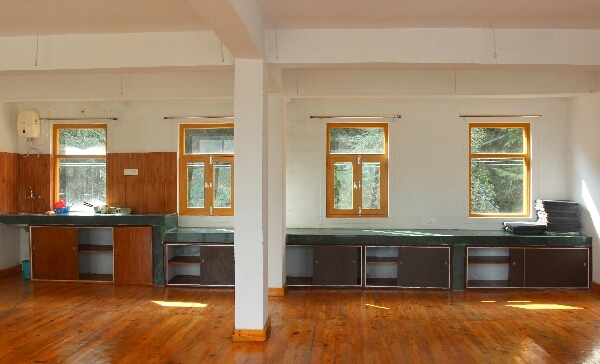 For that, dharamsala is very possible next semester again. Thank you for all non teachings- teachings! 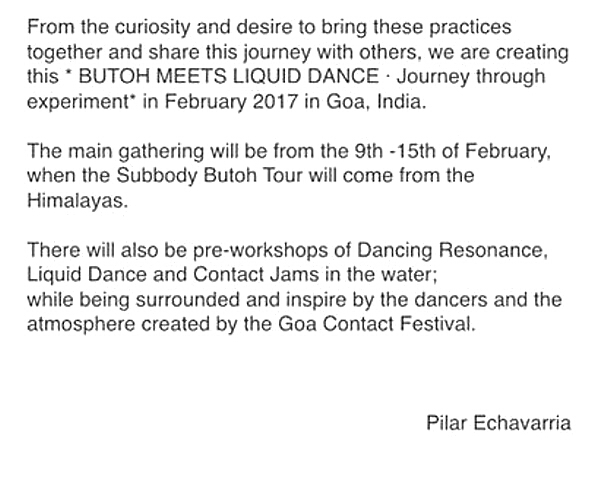 We meet in Goa, I will be here with Pilar waiting for you all. Priyal Loyalka Brilliant workshop..thank u ma'am for this opportunity!!!!!!! Saroj Tivary Yes it was a unique experience ..lucky to be the part of this..thanks ma'am for arranging this. Seema Grover A new kind of experience that takes you to a different level..thank　you ma'am for being in our lives!! Priyal Loyalka Thank u so much ma'am for introducing us to this unique, different, wonderful way of letting go. had never heard of butoh before. three days of so many emotions...felt relaxed, stressed, angry, emotional, happy,s ad, felt like crying ,laughing sometimes. But today just felt freeeeeeee and so so light .thank u sooooo much!!!!! Anita Khandelwal An amazing three day session of letting ourselves flow freely in our emotions individually and collectively. The warmth, energy and emotions took us to a different world within ourselves. For the first two days the body felt pain, stress and tiredness but today we felt so peaceful, calm and relaxed and floated together in the most wonderful way. Thank you ma'am for this amazing and unique experience. 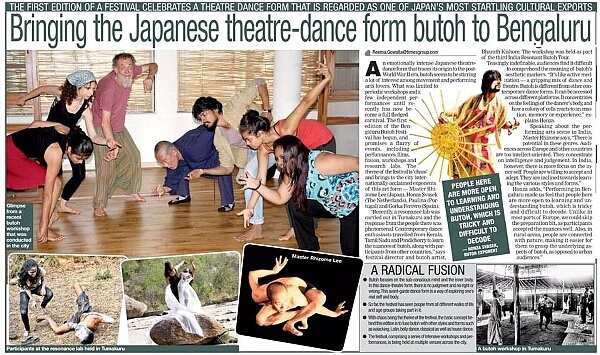 The Japanese dance-theatre form, Butoh is slowly finding a place in the cultural space of Kolkata, with upcoming festivals such as the 2nd Kolkata International Butoh Festival serving as platforms for the promotion of the art. 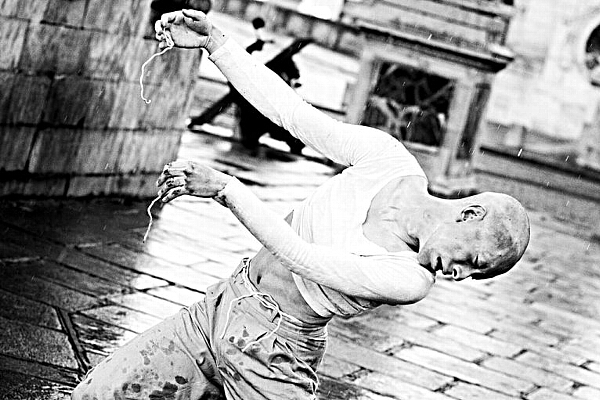 Butoh can be best understood as a performative dance or movement in the space of theatre with performers traditionally appearing on stage with white make-up across the body and movements that are controlled very precisely. Not a theatre form that is aesthetically and philosophically appreciated by all, or easily defined, this avant-garde form has a disputable point of origin. However, most agree that it surged following World War II, in Japan, with key ‘founders’ such as Hijikata Tatsumi, was the turning and starting point for the modern to postmodern foundation of the art. 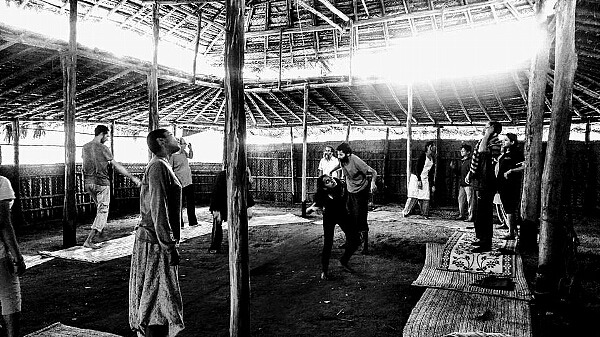 Kolkata, the capital of eastern Indian state of West Bengal, has found this expressive form of performance art interesting, creating an existence in the city, although the circle is small. “Butoh is finding a space in the city which was otherwise becoming stagnant in its theatrical forms. 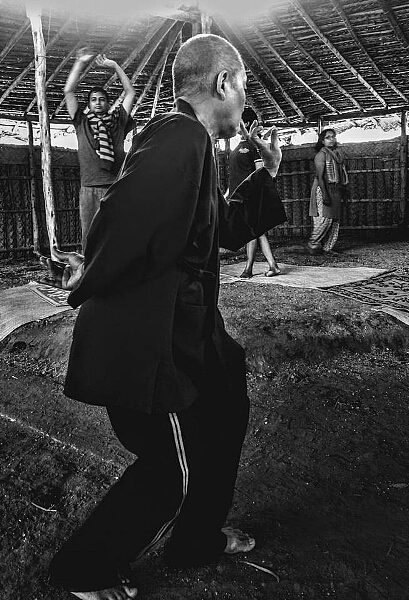 Although there have not been too many practitioners in the past, with the commencement of the annual Kolkata International Butoh Festival last year, I think Butoh will be more accessible and therefore understood,” states Sudipta Dawn, Director of Culture Monks, which collaborated with others to create this festival. 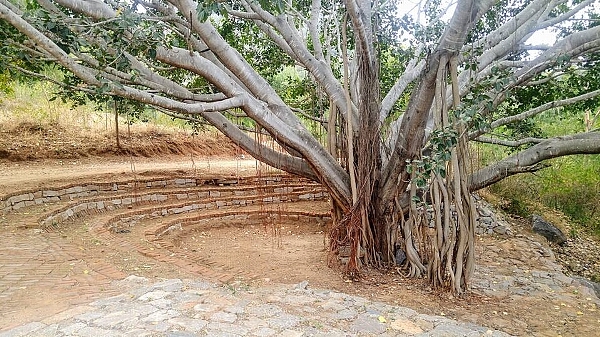 Organisations such as Culture Monks have brought forth theatre nights with Butoh performers in the past, in spaces such as the French cultural centre Alliance Francaise du Bengale. 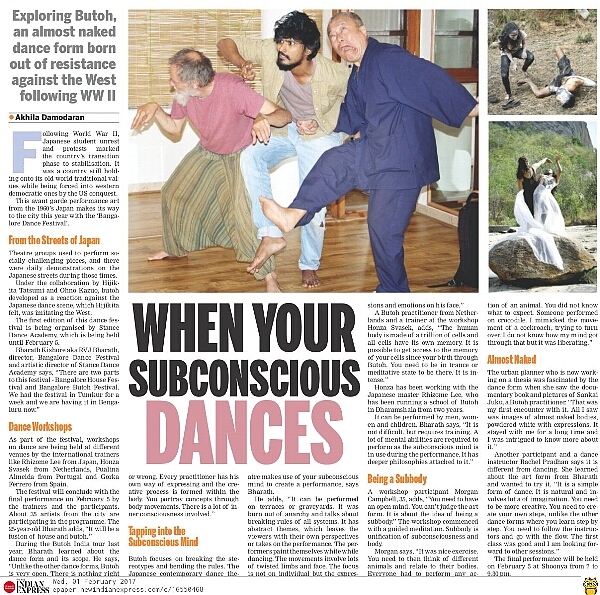 Even with a changing socio-political scape since the time this theatre-dance form found a strong base, Butoh remains relevant and is explored by young artistes in Kolkata as a mode of expression. Describing what Butoh meant to her, Deb stated, “It is a form of movement which came out of devastation, death and destruction. So, it looks like every thing is falling apart, like chaos. 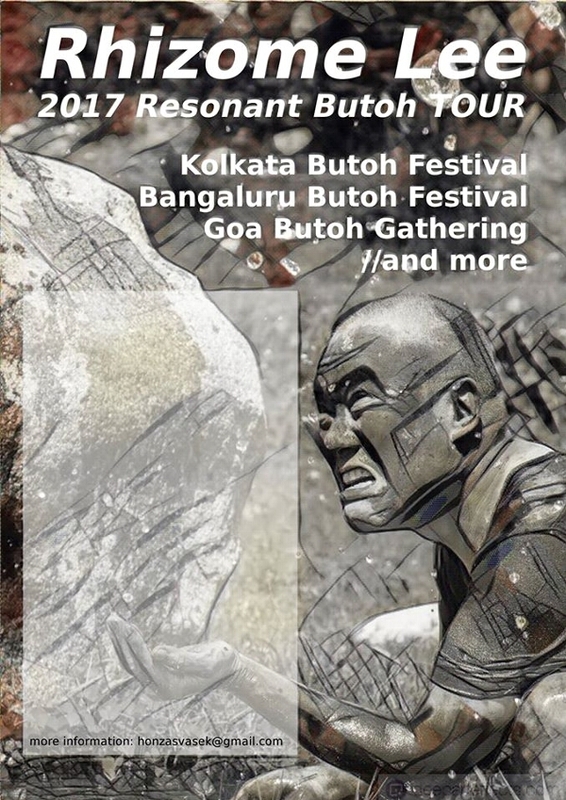 But like any kind of chaos, there is intense order, and strength within Butoh, which basically comes from one’s own personal discipline, of harmony between body and mind.” For those looking to explore this dance-theatre of the inner self, the 2nd Kolkata International Butoh Festival is a great space to look forward to. 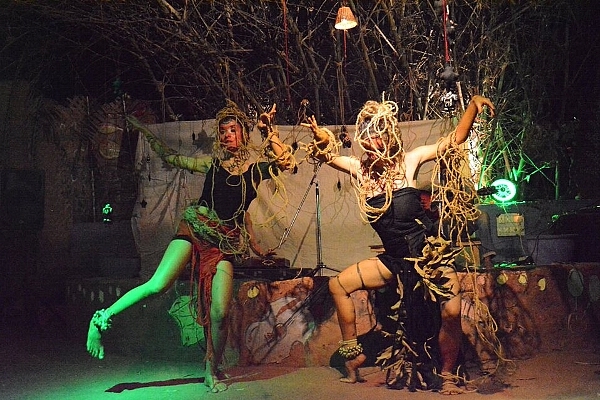 Laura Dyduch performing the Butoh dance at Varkala. On New Year’s Eve, some of the tourists who arrived at Varkala from near and far to welcome 2017 got the opportunity to see a kind of dance they had never seen before. Surrendering to bigger forces of nature and the universe, we are being moved, we are being danced and transformed. When we immerse our body in the water, all our skin is being touched by that powerful magic fluid that have all the memories of all life and death. When we physically allow ourselves to be moved by it, a cognitive poetry of our liquid body can unfold, awakening ancient wisdoms, timeless memories, infinite imaginaries… our LIQUID DANCE. Breathing, breathlessness… that subtle constant wave moving us, that natural and dramatic essence that shine or disappear when we are in the water; bringing up fears, pleasure, wildness and vulnerability. 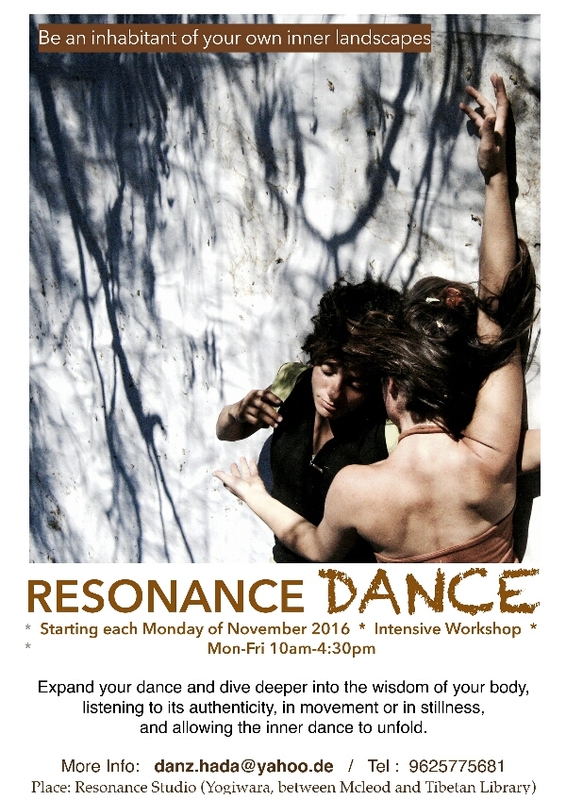 Bringing the Subbody Butoh Method into the Waters and merging it with others practices and methods from Aquatic Bodywork, Somatic Arts and Contact Improvisation; we will explore to surrender to the flow and forces of the water, while being an active initiator of the dance that our life wants to embody. 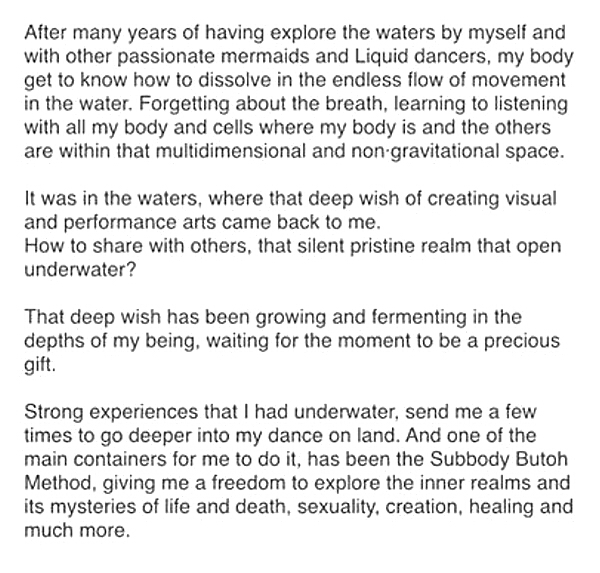 How does our dance and body can expand, when bringing these Arts of Movement together in Water and Land? Which creations may unfold from these explorations? 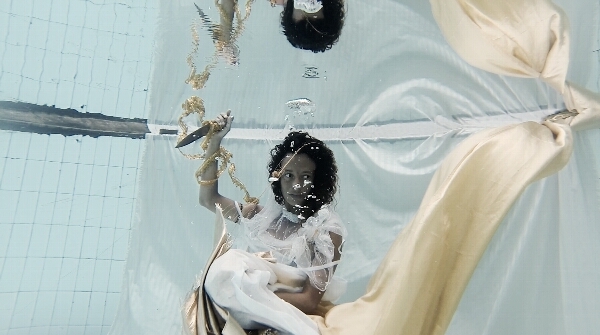 Underwater performances, mermaid healings, rituals in wonderland, nothingness, deathlessness…? 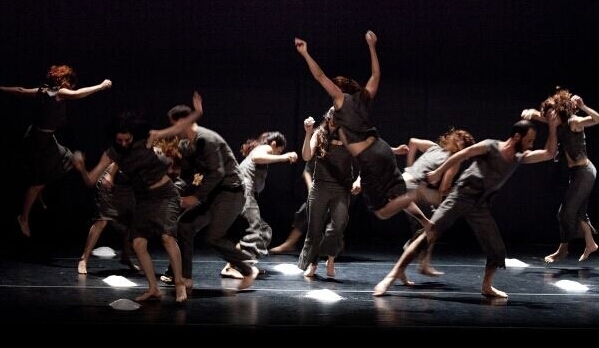 to create and express your wild and true dance! 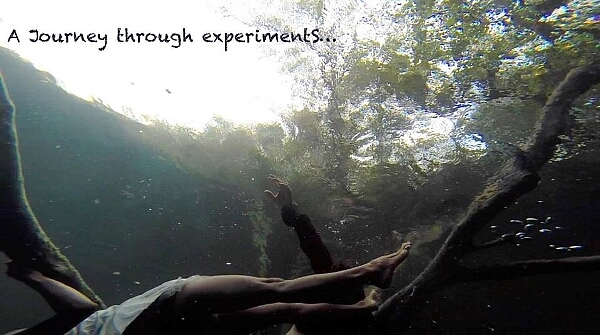 and an intention of exploring and inhabiting a fluid state of presence. With the support of practices, frames and scores of exploration from different methods: Aquatic Bodywork (WaterDance, Fluid Presence and Aguahara), Subbody Butoh, Somatic Movement Arts, Continuum Movement, Breath and Sound practices and Contact Improvisation; we will explore how water can nurture, open and transform our authentic dance, while researching our intimate relation with breath and water, and the transitions between water and earth. * Open to everybody, no previous experience is needed. Through the Subbody Butoh Methods, you can travel in your whole self world and create your own Subbody Butoh dance, which is entirely unique to you… Feeling the subtle sways in your body and mind, listening to the sub-signals from your subconscious, meditating, breathing, surrendering to be moved and resonating with various other worlds behind this world. 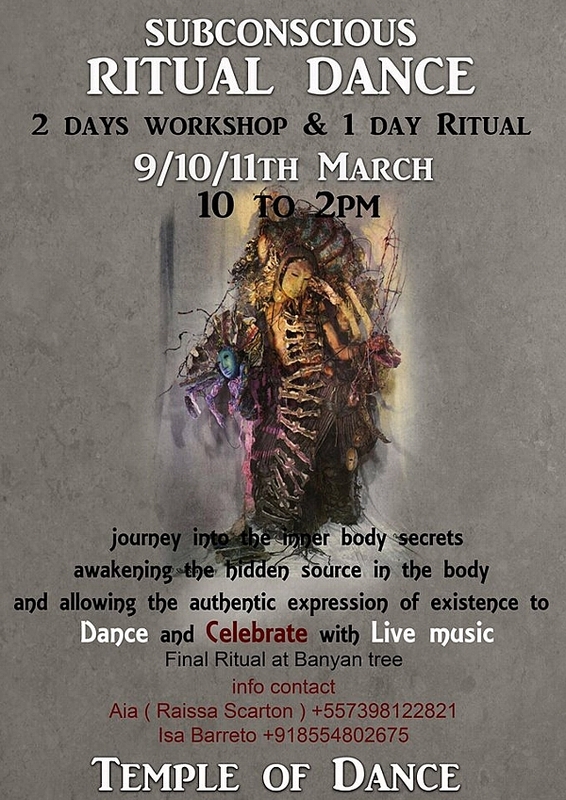 In this Workshop we will open the potential of creativity and authenticity that are folded in the darkness of the waters of the body, focusing on “The Flower, the Mystery, the Secret”, to enhance the beauty of the dance that emerges from our Water being. The Flower: the deep life resonance between a moment of the dance and the life of the witness or of the world. The flower of timing, the flower of change, the flower of density. The flower is nurture by the blood of the dance. The Mystery: Which is the mystery hidden in your body that moves you? What makes you dance? Why do you dance? What moves you? How can you go deeper into your own Butoh world? The Secret: While encountering the deep mystery, flowers start blossoming and our body is being moved by bigger forces. When physical movement and the stream of life crystallize as oneness, it becomes a dance… the secret of the dance. How to hunt the secret? “The beauty of life seems to be muddled by the chaos of the Flower, the Mystery and the Secret; which are from an unknown world”. 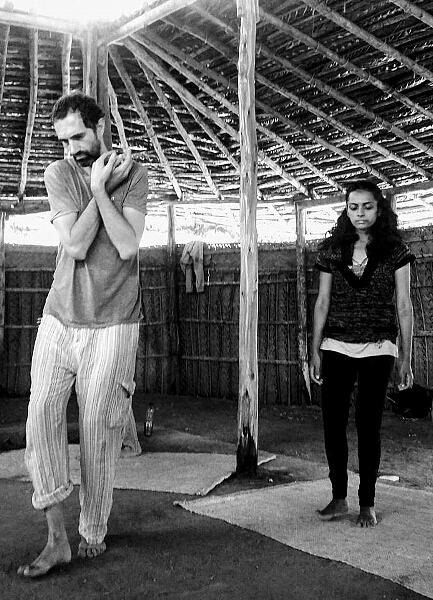 We are planning the 3rd India Resonant Butoh Tour as well as the previous tours. 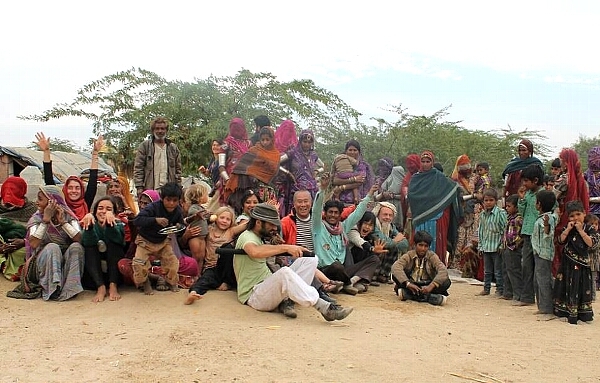 Spread the breath of Life Resonance all over the India among various kinds of artists, young people including tribal people, and build flexible network in India for exchange, collaboration, support young peole, education and so on. 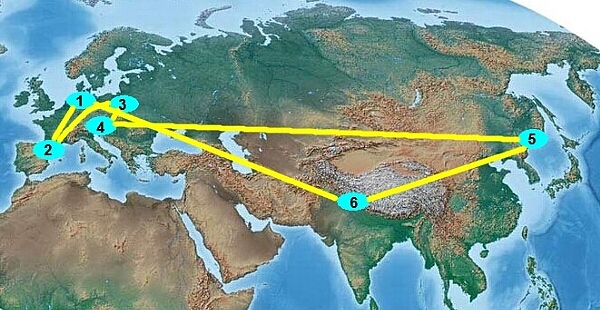 Toward the worldwide network beyond all borders.